Hi! How the heck are ya? I’m finally getting a few things done on our entryway and I’m excited to share with you how it’s coming together! It’s always fun to see how some small and simple changes can create such a great impact! If you remember before, this is what our entryway looked like. One lonely little peg hook rack that was rarely used. I decided it was time to makeover this space! Afterall, this is the first thing people see when they come into our home. Our challenge for this space was the size of it. Or shall I say, the lack thereof! We have a narrow foyer that leaves little to no room for furniture. Still, there are a few basic elements used in creating a welcoming space that we were able to incorporate here. 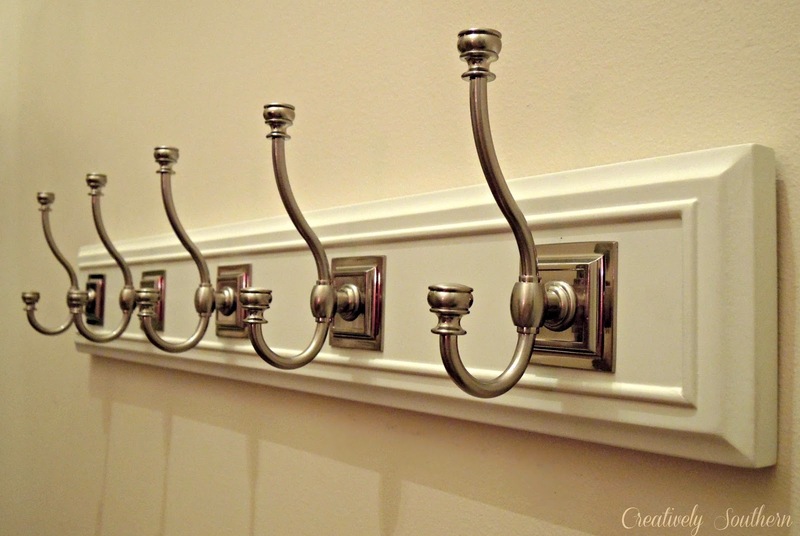 First, was to replace the peg hooks with a better coat rack. I picked this one up at Lowe’s for about $25. It has 5 hooks, and so far has proven to be equipped to handle our heaviest coats. I don’t have a lot of purses or jewelry, but I have 6 or 7 coats or jackets. 🙂 I love the style of those hooks! 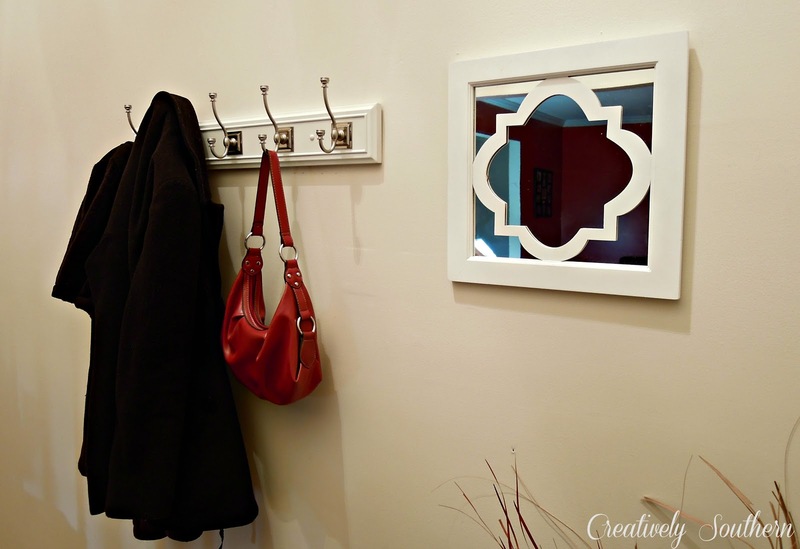 The next step was to add a simple but stylish mirror. I love the design on this one and it’s the perfect size for our space here. This mirror came from Target for around $15. 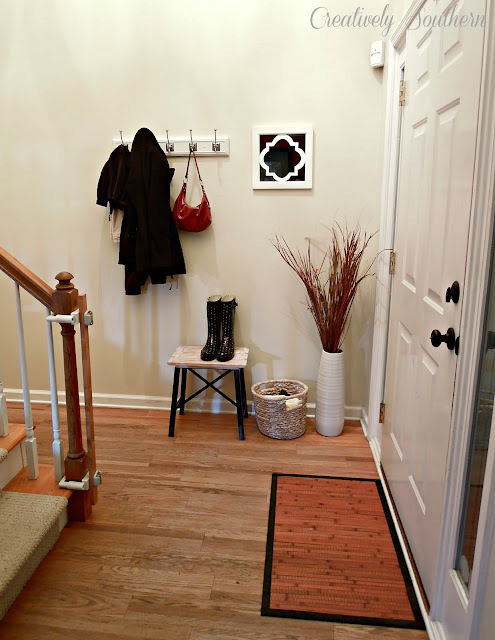 I could not find a console table or ledge that would fit this space without interfering with the opening of the front door or with the hanging items. So I went with this small stool that I found at HomeGoods! It works like a charm. Our little girl loves to sit here in the morning and put her shoes and jacket on before we leave. I found the basket at Target and it works perfectly for our scarves, gloves, and hats. I’m still pondering on adding some curtains to the front door to help add some privacy to the sidelights. I found this inspiration from Southern Living and I just can’t seem to stop staring and swooning at this entryway. I love how the banister is stained dark in this home too. Can you see the wheels spinning in my head?? More and more ideas!! More and more to-do projects! 🙂 New rug, stained banisters, curtains – I can see it all coming together. Overall, I’m so happy with our small entryway and I’m not ashamed to welcome people in our home now. It’s so nice to have a spot to put all our stuff! Although, I’ll be honest. We keep this coat rack covered up most times. Hey, where did that Target bag come from? Just keeping it real for ya! 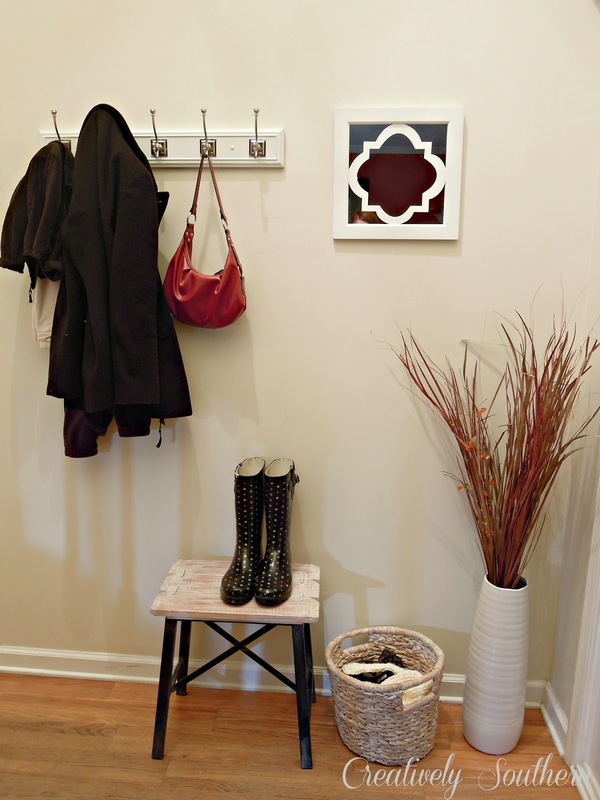 What elements are must haves for your entryway area? Thanks Amy! I love that little stool too! So fun and functional for our space. 🙂 Thanks for stopping by! 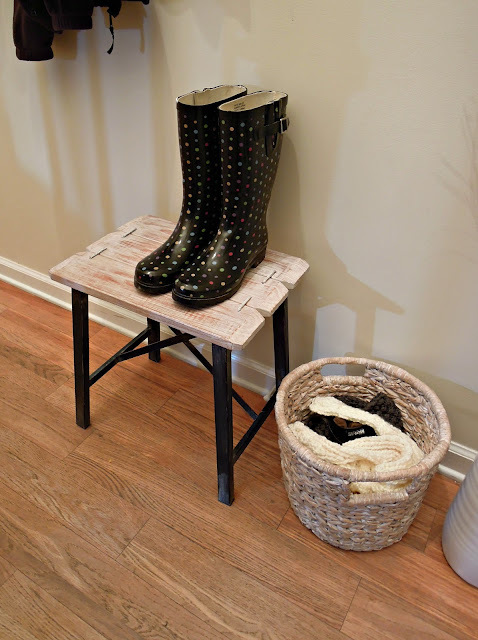 That stool from HomeGoods is so fantastic-Great job on the entry way! 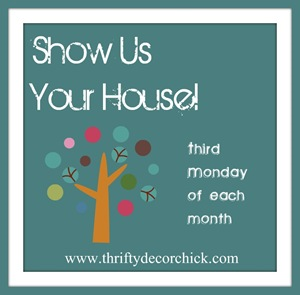 We have a small entry too that I’ve been wanting to spruce up – love these ideas! 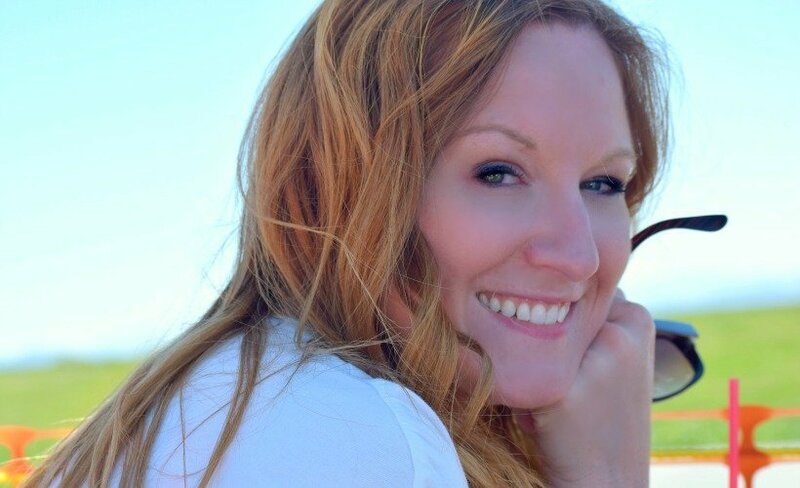 Thank you so much for sharing your creativity at Mom On Timeout. Hope to see you back tonight! I love the new look. The curtains would be great as well. Nice look for a small place. Good job. I’m your newest follower. Looking forward to seeing more from you in the future. I think you did a great job, very stylish but functional! Your new entry touches look great, very inviting. I LOVE the Southern Living entry too….thinking about burlap curtains for our doorway.